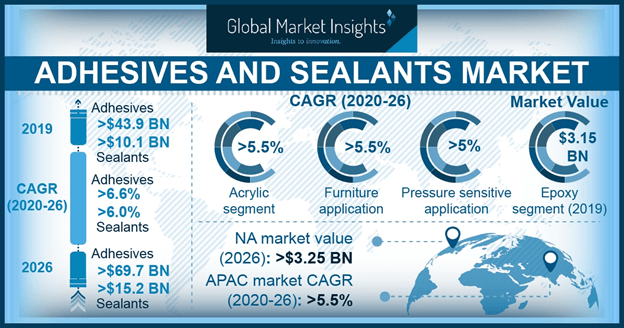 Adhesives and Sealants Market has been an appealing investment focus for the chemical multinational companies on grounds of the commendable increase in the product demand across myriad industries. Chemical industry magnates such as Dow Chemical, BASF, 3M, Bayer, Eastman Chemical, and Franklin International are some of the prominent companies partaking in the evolving adhesives and sealants industry trends. These companies are making constant efforts to diversify and improve their product portfolios. Adhesives and sealants industry is a consolidated business space with the established brands captivating almost 40% of the overall share. The industry is characterized by frequent mergers and acquisitions and huge R&D investments for the expansion and development of the existing product portfolios. The buzzing trend of environmental sustainability which can be primarily achieved by curtailing the hazardous gas emissions in the atmosphere is bringing a rather drastic change in the global adhesives and sealants market dynamics. Companies have embraced sustainability as a vital part of their corporate responsibility agenda. In this regard, bio-based adhesives and sealants is the new focus area of the industry participants. Soybean polyols and vegetable oils are replacing the traditional raw materials such as resins, crude oil, and synthetic fibers, as the latter has been pointed out to result in carbon emissions during the production processes. Currently, bio-based adhesives and sealants market holds 2% of the overall industry share. Despite such minor contribution, this market is certain to witness strong growth path over the coming years. Key players such as Dow, Evonik, BASF, ADCO, Dupont, etc. have already established their strong foothold in the bio-based adhesives and sealants industry. The rapid urbanization and increasing global population have significantly fueled the expansion of automotive and construction sectors. This development has parallelly created a strong ground for the growth of adhesives and sealants industry, as the two aforementioned sectors are regarded as the top revenue generators for the overall adhesives and sealants market. Speaking of the contribution by automotive industry toward the overall adhesives and sealants market, the growth curve has been indeed appreciable. The statistics depicting the global automotive production to surpass 110 million units by 2022 validates the strong growth claim by the adhesives and sealants industry. Reportedly, a passenger car on an average consumes 15-18 kg of sealants and glues for the replacement of mechanical fasteners. This vividly portrays the huge sealants demand by the rising automotive sector. As per the estimates, sealants market share from automotive industry was USD 1.75 billion in 2015 and is estimated to register an annual growth rate of 5.4% over the period of 2016-2023. The BRICS nations have been the major growth avenues witnessing the development of adhesives and sealants market. The swift economic upsurge and the rapid industrialization in these countries have provided a significant push to the construction and automotive sectors’ expansion. Allegedly, the construction spending in India and China in 2013 was USD 425 billion and USD 1.6 trillion respectively, which is indeed huge. As per the estimates, the sealants market size from the construction sector was 510 kilo tons in 2015 and is estimated to surpass a revenue of USD 2 billion by 2023. India and China being the prominent revenue pockets for APAC will drive the regional market share significantly over the coming years. Asia Pacific adhesives and sealants market dominated the global landscape accounting for 40% of the overall share. In addition to the automotive and construction sectors, the growing Flexible Packaging Market is also offering lucrative growth opportunities to the adhesives and sealants industry. Packaging applications are projected to register a CAGR of 5% over the period of 2016-2023, according to the study. The developed nations are also fairly contributing to the adhesives and sealants market share. The large presence of established manufacturing companies in these countries leverages their industry participation. In this regard, Europe sealants market size is projected to surpass 700 kilo tons by 2023. North America, primarily led by the U.S., is anticipated to exceed a market valuation of USD 8.5 billion by 2023. The global concern toward the rising VOC emissions is substantially influencing the technology landscape of the adhesives and sealants industry. Out of the four popular technologies used- Solvent, Hot Melt Waterborne, and Reactive, waterborne adhesives and sealants market dominated the technology landscape holding 47% of the overall demand in 2015. The growth can be attributed to the low VOC emissions via deployment of this technology. Hot Melt Adhesives Market size having had a valuation of USD 5.5 billion in 2015, is estimated to exhibit an annual growth rate of 6% over the period of 2016-2023. With the robust development in the automotive and construction industries and the swift economic growth of the emerging economies, the adhesives and sealants industry is poised to generate a substantial momentum in the years ahead. An estimate by Global Market Insights, Inc. claims this market to exceed a revenue of USD 50 billion by 2023.